The Montagna Wood Collection now includes a porcelain wood look tile that conveys the appearance of aged wood that has been weathered and reclaimed. Montagna Wood Weathered Brown 6 in. x 24 in. Porcelain Floor and Wall Tile is designed with a rich blend of shades and textures ideal for modern floors and walls. Weathered Brown replicates a natural weathered finish that will transform any space. Express your personal style by installing this tile on the floor or walls, horizontally or vertically. Long gone are the days of waxing, staining and sanding - enjoy the beauty of natural wood with the durability and ease of maintenance of porcelain tile. 14.53 square feet, 15 pieces per case. Case weight is 57.97 lb. 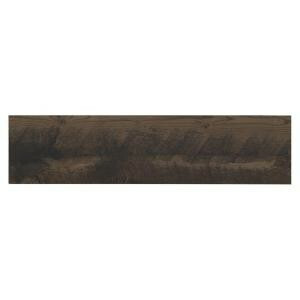 Buy online MARAZZI Montagna Wood Weathered Brown 6 in. x 24 in. Porcelain Floor and Wall Tile (14.53 sq. ft. / case) ULS3624HD1PR, leave review and share Your friends.